These healthy overnight oatmeal recipes make for a quick and easy grab-and-go breakfast throughout the week. 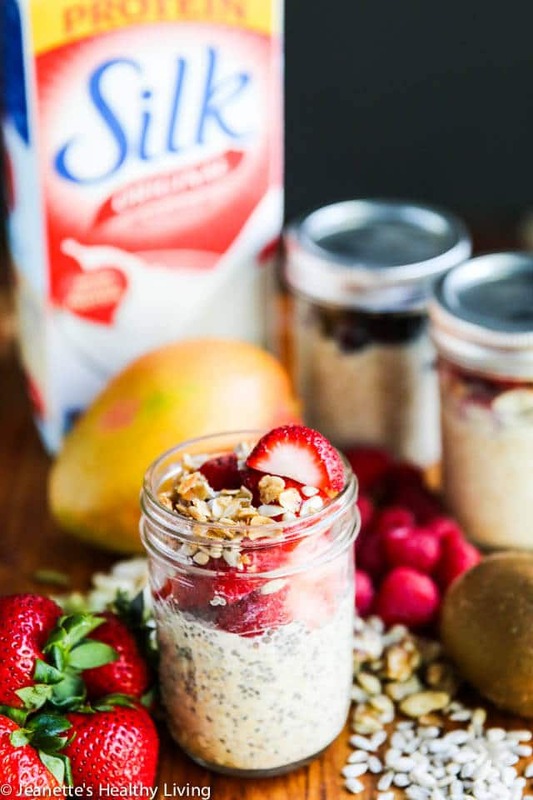 If you’re looking for a healthy start to the day, overnight oatmeal in a jar is a fun way to get off on the right foot. By mixing and matching different fruit and nut combinations, you won’t tire of this convenient breakfast-on-the-go option. I’m always looking for quick and easy protein-packed foods when I’m short on time. Healthy Overnight Oatmeal has become my best friend in the morning because I can just grab a jar from my refrigerator and breakfast is served. Fresh fruit and nuts add fiber and nutrients as well as color, flavor and crunch, and unsweetened Silk Original Soymilk provides 8 grams of heart-healthy, plant powered protein. We have dairy intolerances in our family, so Silk Original Soymilk provides a great dairy-free alternative that’s non-GMO, naturally low in saturated fat, has no cholesterol, and tastes creamy and delicious. 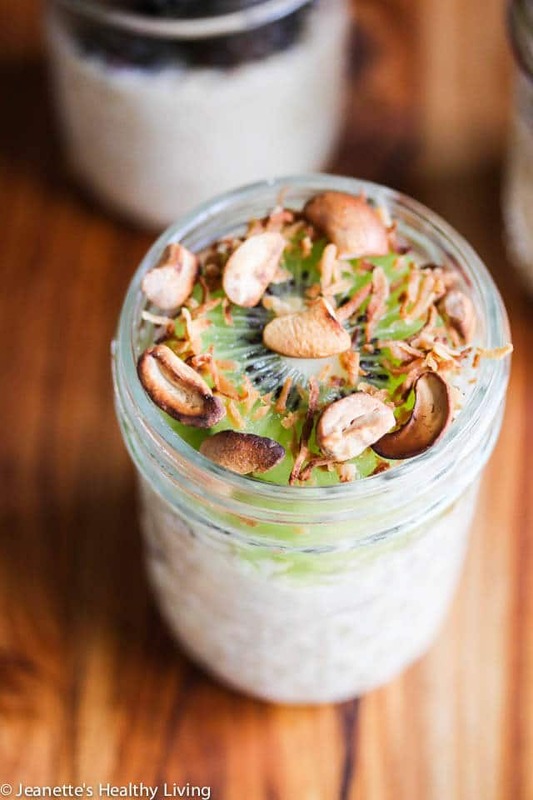 What I love about healthy overnight oatmeal recipes is that you can make a batch of it at the beginning of the week and have enough to grab-and-go for the entire week. There’s no cooking involved. You can even add the fruit ahead of time to save an extra step in the morning. I’ve come up with twenty healthy overnight oatmeal recipe combinations that will keep breakfast exciting for weeks on end (scroll down to the end of this post for all the combinations and nutrition facts). I’ll be making batches of these for my husband to take to work this summer – they’re the perfect grab-and-go breakfast. Try different combinations of fruits and nuts for something different each day. Scoop 1/2 cup oatmeal into each of 5 mason jars (I used 1/2 pint jars). Add 1/2 cup milk, 1 tablespoon chia seeds, 1 tablespoon maple syrup, and 1/4 teaspoon vanilla to each jar. Stir contents of each jar; cover and refrigerate overnight. Top each jar with 1/2 cup of fruit and 1 tablespoon of nuts. Calorie count depends on the fruits and nuts you choose. Make the basic Overnight Oatmeal recipe and try any or all of these healthy overnight oatmeal recipes. Since I serve fruit to my kids at dinnertime, I just save 1/2 cup of fruit for my overnight oats for the next morning. 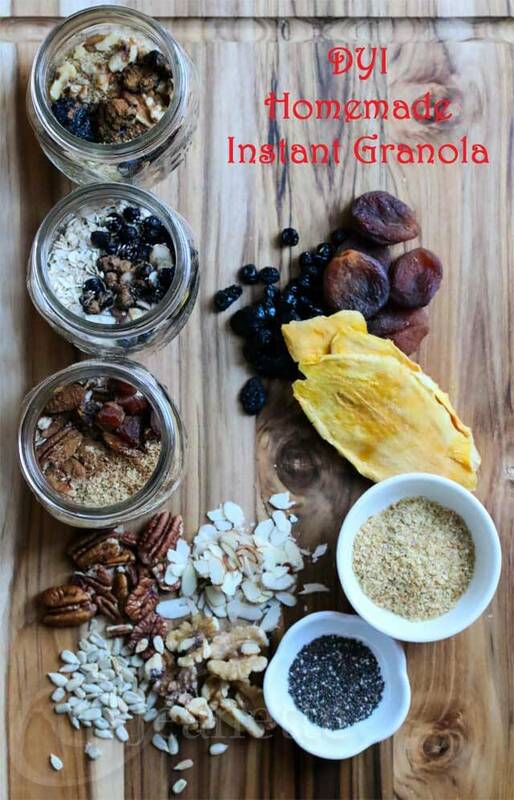 I hope you enjoy these healthy overnight oatmeal recipes. What’s your favorite combination? The post 20 Healthy Overnight Oatmeal Recipes appeared first on Jeanette’s Healthy Living.